The abstract for my LSA panel about popularizing linguistics online is now up. I had some fun with #LingTomSwifties on twitter. A course on understanding people in Ipswich: Is the course in Ipswich, or the people? Centre embedding: New speech disorder linguists contracted discovered! I ran a series on my blog about the various possible ways to teach yourself to draw syntax trees. So, you asked the internet how to draw syntax trees. Here’s why you’re confused. What do we even mean by a syntax tree? I also attended NWAV 43 (New Ways of Analyzing Variation) in Chicago (which memorably involved witnessing this song to Bill Labov), and NELS 45 (North-East Linguistics Society) in Boston. 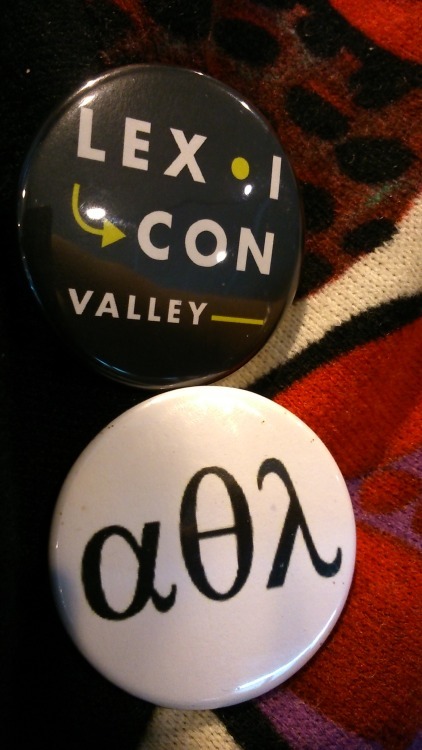 Here are my Lexicon Valley and All Things Linguistic pins for conference-wearing!